over 10,000 Life Application notes to challenge readers to apply the truths of Scripture to everyday life. 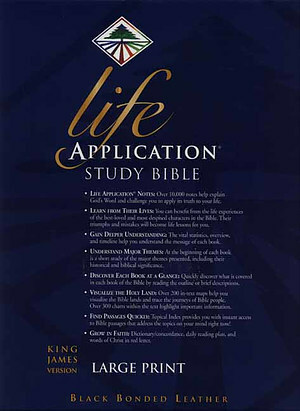 KJV Life Application Study Bible Large Print by Tyndale House was published by Tyndale House Publishers in March 2003 and is our 28247th best seller. The ISBN for KJV Life Application Study Bible Large Print is 9780842368865. Be the first to review KJV Life Application Study Bible Large Print! Got a question? No problem! Just click here to ask us about KJV Life Application Study Bible Large Print.